NORTHFIELD, Ill. – January 1, 2015 – Today, at the 2015 Bridgestone NHL Winter Classic® featuring the Chicago Blackhawks® and Washington Capitals® broadcast on NBC, the puck officially drops for Kraft HockeyvilleTM USA – the search for America’s most passionate hockey community. Uniting an all-star roster of partners including the National Hockey League Players’ Association (NHLPA), National Hockey League (NHL®), NBC Sports Group, and USA Hockey, Kraft’s award-winning, Canadian-born HockeyvilleTM program has expanded into the U.S. for the first time to help build better hockey communities across the country. Beginning today, hockey communities across the U.S. can vie for the esteemed title of “Kraft HockeyvilleTM USA” and enter for a chance to win the grand prize of hosting an NHL® Pre-Season game televised live on NBCSN and $150,000 in arena upgrades. Kraft also drafted a friend – NHL® legend and NBC Sports analyst, Jeremy Roenick – to help spread the word across the country. Like a hockey game, Kraft Hockeyville USA has three periods. In the first period, communities across the country are encouraged to enter by sharing unique stories about their local rink, teams, hockey spirit and passion and submitting their nominations now through March 18, 2015, at www.KraftHockeyville.com, where complete contest rules and nomination applications are available. •	Round 1 (April 14-16, 2015) – Top four communities chosen to move on to the next round; remaining six each receive $20,000 toward arena upgrades. •	Round 2 (April 21-22, 2015) – Top two finalists selected; remaining two each receive $40,000 toward arena upgrades. 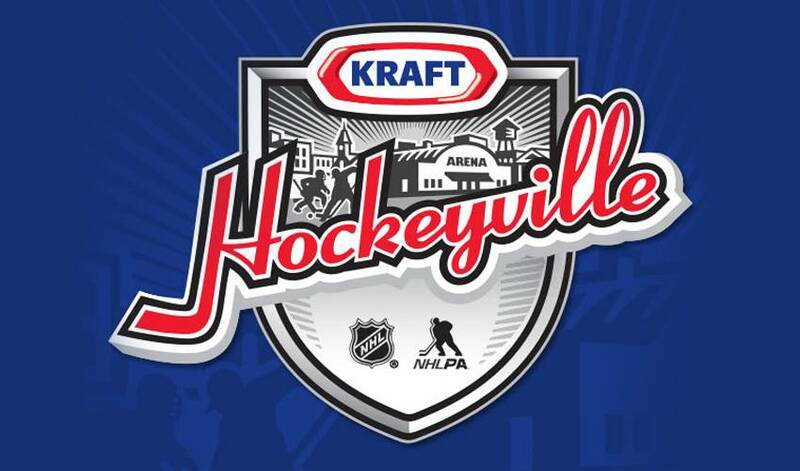 •	Round 3 (April 27-29, 2015) – One community will emerge as the first-ever “Kraft Hockeyville USA”; runner-up will receive $75,000 toward arena upgrades. Kraft Hockeyville USA is meant to not only ignite a passion for hockey in America, but also bring a renewed sense of pride to communities. Since launching in Canada in 2006, Kraft Hockeyville has positively impacted 43 communities with more than $1.6 million donated in arena upgrades. Kraft also hopes that its diverse portfolio of products will help unite hockey fans in their celebrations of the sport and their communities. The campaign will celebrate consumers’ excitement around a variety of iconic Kraft brands, including A1, Bulls-Eye BBQ Sauce, Cracker Barrel, Jell-O, Kraft Mac & Cheese, Kraft Mayo, Kraft Natural Cheese, Kraft Salad Dressings, Kraft Singles, Maxwell House, Miracle Whip, Oscar Mayer, Philadelphia, Planters, Stove Top and Velveeta. ### NHLPA, National Hockey League Players’ Association and the NHLPA logo are trademarks of the NHLPA. © NHLPA. The National Hockey League Players' Association (NHLPA), established in 1967, is a labor organization whose members are the players in the National Hockey League (NHL). The NHLPA works on behalf of the players in varied disciplines such as labor relations, product licensing, marketing, international hockey and community relations, all in furtherance of its efforts to promote its members and the game of hockey. In 1999, the NHLPA launched the Goals & Dreams fund as a way for the players to give something back to the game they love. Over the past 15 years, more than 70,000 deserving children in 32 countries have benefited from the players' donations of hockey equipment. NHLPA Goals & Dreams has donated more than $22-million to grassroots hockey programs, making it the largest program of its kind. For more information on the NHLPA, please visit www.nhlpa.com. When the Comcast-NBCUniversal transaction was completed in January 2011, the sports assets of the two companies combined to form NBC Sports Group, which serves sports fans 24/7 with premier live events, insightful studio shows, and compelling original programming. The sports media company consists of a unique array of sports assets, including NBC Sports, NBC Olympics, NBCSN (NBC Sports Network), Golf Channel, 10 NBC Sports Regional Networks, NBC Sports Radio and NBC Sports Digital. NBC Sports Group possesses an unparalleled collection of television rights agreements, partnering with some of the most prestigious sports properties in the world: the International Olympic Committee and United States Olympic Committee, the NFL, NHL, NASCAR, PGA TOUR, PGA of America, USGA, Churchill Downs, Premier League, MLS, Tour de France, French Open, Formula One, IndyCar and many more.